The Carpinteria Lions Park consists of two separate areas, the lodge and the picnic area. The park offers an expansive lawn with a log cabin style lodge on one side and a picnic area on the other. The sizable lawn is surrounded by tall trees and a charming gazebo. It provides many options for designing an event with your own personal style. You can have a ceremony at the steps of the lodge or gazebo, have hors d’oeuvres and cocktails on the lawn before heading inside for a reception, or dine and dance under the stars. The park offers versatility and natural beauty that sets us apart from other venues. This is a stunning location that offers the perfect romantic setting for an outdoor wedding ceremony. Indoor events will accommodate up to 160 guests and outdoor events will accommodate up to 200 guests. Opposite the Lodge, across the lawn is our spacious outdoor barbeque area. It comes complete with: a full kitchen, huge barbeque pit, built in picnic tables, restrooms, large children’s play structure and horseshoe pits. 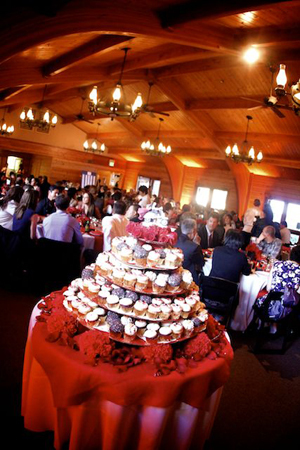 It provides a charming setting for company picnics, birthday parties, reunions and rehearsal dinners. For additional fees we will provide the bar and bartender, volleyball net and uniformed security. The barbecue area will accommodate up to 200 guests. Built in 2008, our full bar has enhanced the beauty and charm of the cedar lodge. Its high ceiling and tall windows frame the view of the park attractively.We offer a large assortment of beer, wine and liquor. California Alcohol Beverage Control regulations require all alcohol be served from the Lions Club bar. 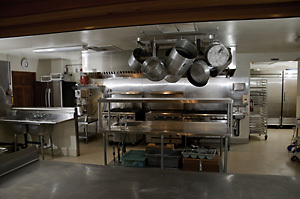 Our comprehensive commercial kitchen is a favorite among caterers. It includes 2 ovens, a grill, refrigerator, freezer, mixer, dishwasher and ample counter space. It is adjacent to the main room for convenient service. You may use your own caterer or hire the Carpinteria Lions Club to cater a delicious tri-tip barbecue along with all the side dishes. 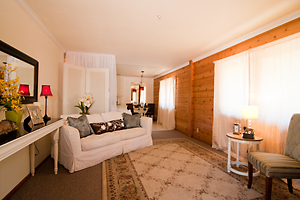 The bridal dressing room offers a convenient and comfortable place for the bride and her bridal party to get ready. Newly remodeled in 2016, with a living room, beauty bar with floor to ceiling mirrors, dressing room with a make up counter and mirrors, full bathroom and ample closet space it is the perfect place for the bride to relax before the ceremony begins, allowing her to take the occasional peak on how things are shaping up. There is an additional fee to use the bridal dressing room and it is only available for use the day of your event. We are happy to announce a new add on feature for upcoming weddings in the lodge-a beautiful lit backdrop! It was custom made to fit between the beams at the front of the lodge (under the flags) but of course you are welcome to place it anywhere inside the building. The LED lighting has eight settings for different effects and you can add your own gauzy or tulle material to it to match your linens! It’s absolutely gorgeous. If you are interested in renting it the cost is $50.